Freight and goods movement plays a role in our every day lives, though many of us don't take the time to really consider the impact. In addition to providing the things we need and want to have, the nation's freight infrastructure is key to securing America's economic future and maintaining our competitiveness in world markets. Growth over the last twenty years, improvements in manufacturing processes, and new technology are placing ever-greater strain on the capacity of our goods movement network. The U.S. Department of Transportation estimates that freight volumes will increase 45 percent by 2045. Will we be prepared to meet that challenge? 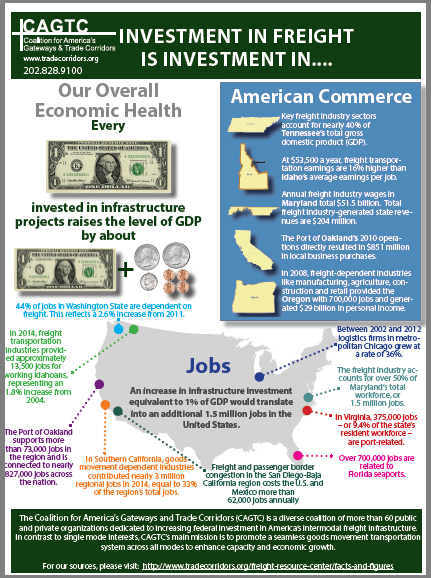 View CAGTC's fact sheet on the benefits of investment in freight infrastructure and the impacts of chronic underinvestment. 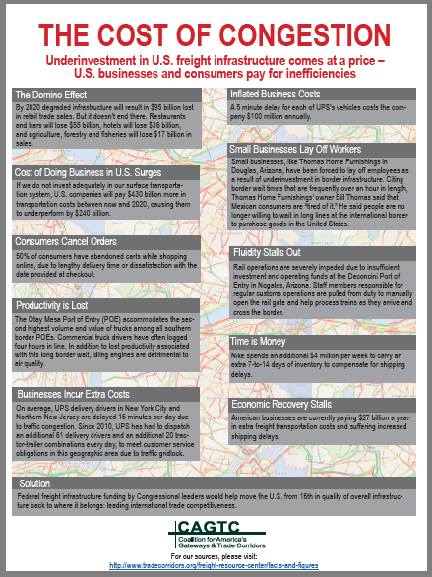 Learn about the many and varied costs paid by businesses as a result of underinvestment in our nation's infrastructure.